Dec 15, 2017 • Today at #AGU17, Peder Nelson, a research remote sensing scientist at Oregon State University in Corvallis, Oregon, is giving a talk on the IceTrendr glacier monitoring project. How does IceTrendr “tell the story” of glaciers? By using all the cloud-free Landsat images, we are able to reveal the dynamic nature of glaciers. In our pilot project, we found the expected glacier areas that are ‘stable’ or have had a transition of glacier ice to rock. However, we also found more complex multi-year changes like ‘transition of glacier ice to debris-covered glacier ice to open water to bare rock to vegetation’. What is truly innovative is that IceTrendr not only maps the changes but also uses expert knowledge to label the changes and such labels can be applied to other glaciers exhibiting similar temporal signatures. Do you have plans to make IceTrendr global? Yes, we are currently testing the temporal segmentation algorithms in Google Earth Engine and NASA Earth Exchange (NEX). The challenge is finding enough on-the-ground data to let us know how our methods work as we move away from these test locations. 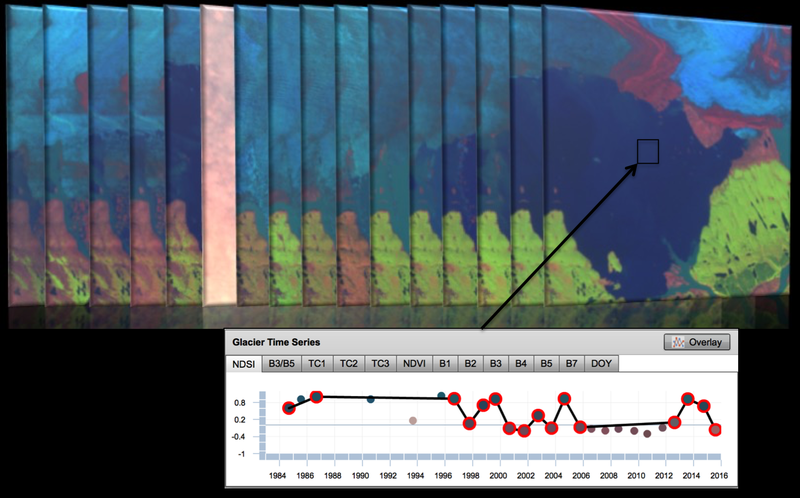 The Landsat series of satellite images provides an unprecedented ability to time-travel to back to the 1980’s and then watch not only the glacier change over time but also reveal the patterns and processes that happens when a glacier surges, recedes, or stagnates. One important story, is shrub vegetation starting to grow on top of the glaciers. With the Landsat archive and continued data collection, we are able to identify this change in land cover, rate of vegetation growth, and what it could mean for Earth’s radiation budget. Since 1986, the dynamic Bering Glacier, located in southwest Alaska (60.148705º, -143.4759987º) has had a series of surges and retreats which are revealed by the long term Landsat Archive. The image color combination shown above uses Landsat bands 5,4,2. This shows glacier ice in cyan blue, debris-covered glacier in red, open water in dark blue, and vegetation in green. The graph here shows the temporal signature of this location on the glacier using the Normalized Difference Snow Index (NDSI). The years of change are identified with red circles. 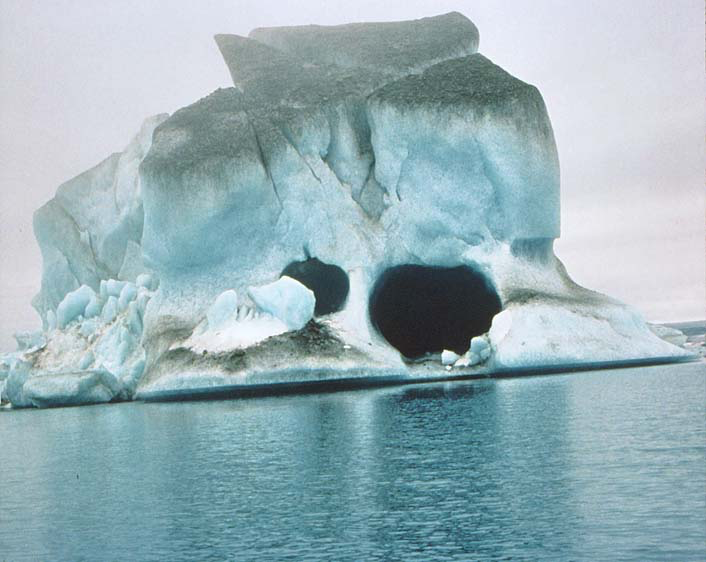 This area started as glacier ice in 1986, then had a period of surging and retreating glacier ice between 1997-2006, followed by a period of open water from 2006 to 2013, and ending with another surge of glacier ice that then retreated leaving open water in 2016. This entry is filed under Carbon and Climate, News, Q&A.